In stock -This product will ship today if ordered within the next 2 hours and 54 minutes. Take your stand and go with purpose, for your path ahead is clear: the soothing splash of peppermint leaf with the calm of sweet fennel seed and rose. In a sip, balance returns and the day ahead looks a whole lot brighter. Take care. 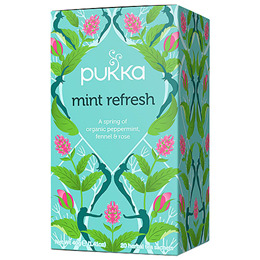 Peppermint leaf (50%), licorice root, fennel seed (10%), hibiscus flower, rose flower (5%), coriander seed. 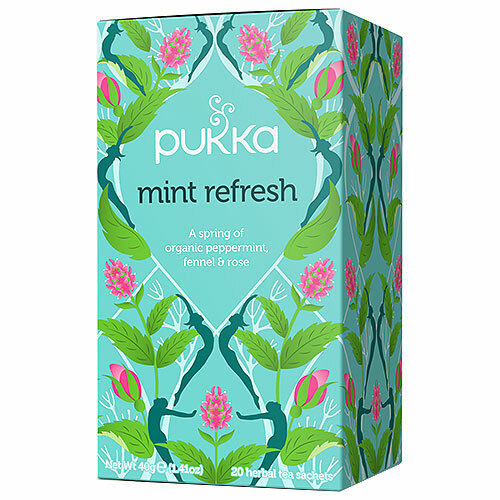 Below are reviews of Pukka Teas Organic Mint Refresh - 20 Teabags x 4 Pack by bodykind customers. If you have tried this product we'd love to hear what you think so please leave a review.